Please read the "Adoption Process" tab and then complete an adoption application if you are interested in adopting! Please know this page is updated DAILY!! Dora is a 3 year old Shih Tzu/Lhasa mix and she weighs about 10 pounds. She arrived in rescue when her previous family no longer could care for her and they left her at animal control scared and alone. She was very nervous there, but has settled into foster care. Her foster mom says, "Dora is a funny, feisty little girl. She gets along with gently playful other pups her size but she does not do well with cats. She would be fine as an only pet. She is independent and does not like other dogs to get in her face. Dora meets most new folks with a smile but she is selective about which males she will trust. She seems to be housetrained on a schedule. I have a fenced yard so I rarely have her on a leash. She gets excited when she sees a leash, so I believe she is an experienced walker. 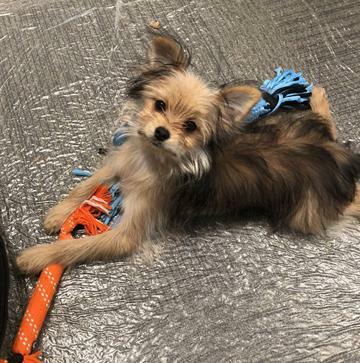 I suggest a quick refresher course using a harness within a safe environment, such as a fenced yard, or even in the house.. She does bark at new sights and sounds, so an apartment or house with shared walls would not work. Dora is quite laid back so a quiet female family would be ideal. Open your heart and your home to Dora and gain a loyal, loving companion!" Dora is spayed, up to date on vaccines, heartworm negative, microchipped and has had her teeth cleaned! She is fostered in the Flagler Beach area, and her adoption donation is $275. 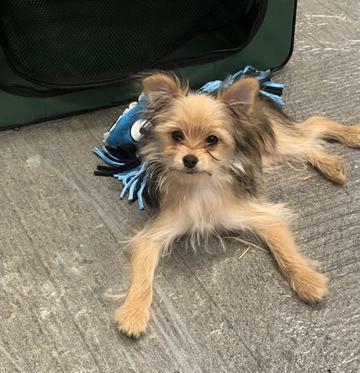 Patti is a 9 month old female Yorkie/Pomeranian mix and she weighs about 7.5 pounds. She really shouldn't get much bigger and should stay under 10 pounds full grown. Patti arrived in rescue with her littermate, as her family realized the could not properly take care of them. Patti's littermates have all found homes, but Patti had big dreams and went on to star in Puppy Bowl on Animal Planet! She is ready to find a family to call her own though, but she does have some special "requests". Her foster mom says, "She is a WONDERFUL girl, just, uhm, a bit of a princess with some quirks that are easily lovable, she just needs the right home to accommodate them. I have never met a dog that wants to be a "purse dog" more than Patti! She LOVES to go everywhere with you and will even ride in the puppy version of a strap-on baby carrier and she loves it! She loves being with her humans and would prefer human cuddle time to puppy play for sure. She does play nicely with the other dogs though. She is a very smart girl, is pad trained and working on her housetraining, but she still hates the leash. She wants nothing, and I mean nothing, to do with a leash - and doesn't understand why she should walk for you on one, you should carry her. However, a fenced yard is one of her favorite places to run out her zoomies and go potty on her own. She will also use pads inside if needed. She is beyond adorable. She even stands on her hind paws and "begs" and dances, and if you stop petting her, she will gently pop you in the face with her paw as a mini "love punch" to remind you she needs ALL the pets! I have truly never met a dog that wanted to be a "purse puppy" more than she does. She is great with older kids, plays nicely with other dogs, although she may annoy senior pups, and travels well. She would be fine as an only pup, if she can go most places with you or you are home a lot. She is crate trained, but will bark if left all alone by herself. She does settle, but shared walls would not be ideal while she works though this. She doesn't bark if she has another young, playful fur friend though. She knows her name, she is very eager to please her humans and wicked smart. She looks like a little fox and can easily steal your heart! Please know she absolutely does shed and is in no way hypo-allergenic - everyone with allergies who has encountered her has reacted." Patti is spayed, up to date on vaccines, on flea and heartworm prevention and microchipped. She is fostered in the Orlando area, and her adoption donation is $450. Meet Otis! 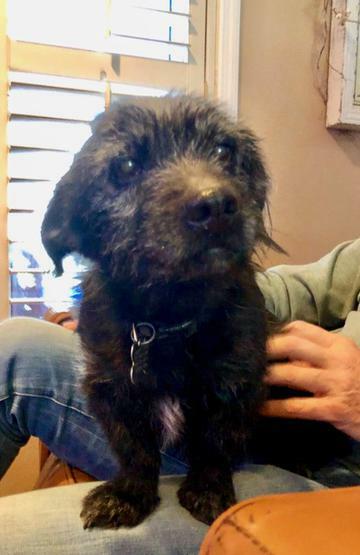 Otis is a 9 year old, male Yorkie/Terrier mix and he weighs about 12 pounds. He arrived in rescue as part of a hoarding case and has settled into pet life and is learning that humans can be gentle and kind. His foster dad says, "Otis is very shy when meeting new people but quickly warms up. When given the time and space needed, he will become your best friend. Otis loves to play with toys and can easily amuse himself. When he’s sure you’re ok, he loves to get belly rubs and give lots and lots of kisses. His tail wags nonstop as soon as he feels safe. Otis loves to play with other dogs in our home so another four legged friend around would be best. He loves to wonder the fenced back yard but can be a bit of an escape artist! He’s not leashed/harness trained and will need someone who is willing to be patient and work with him on this and MUST have fenced in yard. Otis is doing well with his housetraining as long as he can get outside every few hours. He is crate trained and goes into his crate when receiving a treat. Otis is very treat motivated and wants to please. He’s a sweet older guy with lots of love to give and loves to cuddle. Otis will be a great companion and family member." He is neutered, up to date on vaccines, heartworm negative, microchipped and has had his teeth cleaned. 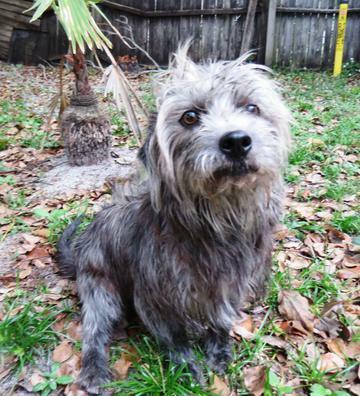 Otis is fostered in the Orlando area, and his adoption donation is $250. 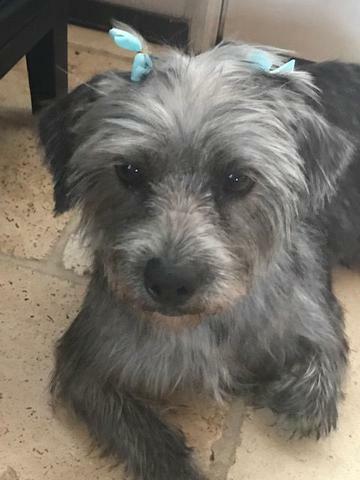 Perla is a 6 year old female Yorkie/Terrier mix and she weighs about 15 pounds. She arrived in rescue as part of a hoarding case and has settled into pet life and is learning that humans can be gentle and kind. Her foster mom says, "Perla is both fun and chill. She loves to run and play with her foster sister, Zelda and when she gets tired, she plops down and relaxes, her preference is on a fluffy dog bed on the floor, although she has explored her options on my dog covered chair, which is probably a little too crowded for her taste. She loves to cuddle in or next to our bed at night.The fireworks chased her under our bed on New Year’s Eve however. She loves to run and hunt lizards in our fenced in yard with the other dogs. Perla gets along with the other 4 dogs in our house, and seems very close to Zelda. She has learned to ignore or casually sniff our dog savvy cat as well. She still needs some time and special attention due to her previous situation. Although she is crate trained, she is not a fan. She is fearful of new animals and new situations. Given gentle patience and time, she adjust nicely. She will need to learn your boundaries and understand rules as she is currently an independent free spirit. She is housetrained. Perla is friendly and very sweet and loving and would do well in a home with other dogs to play with, or older human siblings. She will cuddle with her humans on the couch for tv time and lay by your feet on the bed (or on the floor) at night. She has tons of love to give, and will make a very nice family pet." Perla is spayed, up to date on vaccines, heartworm negative, microchipped and has had her teeth cleaned! 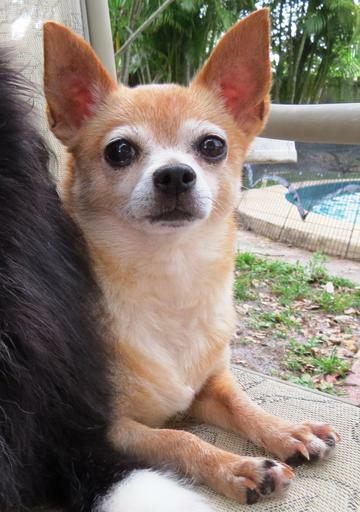 Perla is fostered in the Orlando area, and her adoption donation is $275. 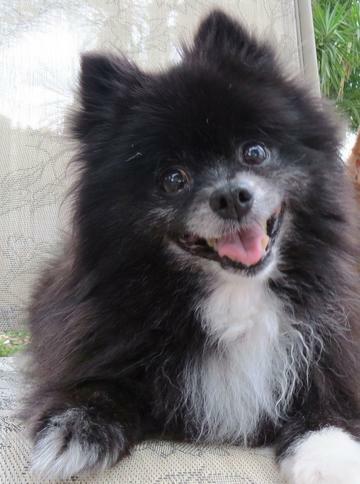 Dolce is a black, female Pomeranian and she is 13 years old and weighs 10 pounds. 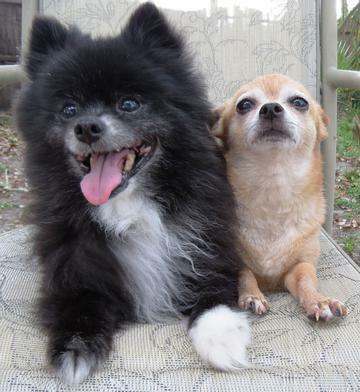 Her bonded companion, Pink is a female Chihuahua and she is 13 years old and weighs 6 pounds. These sweet girls are looking for a family to love both of them! 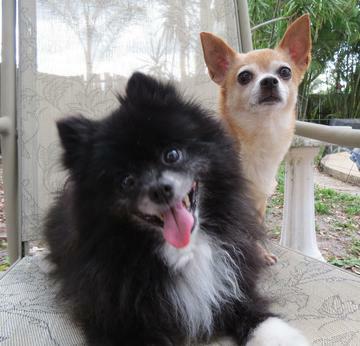 Their foster mom says, "Dolce and Pink are tiny, sweet, and full of personality. They love each other, however tend to grumble like an old married couple. They do not seem to need to sleep together, but in all other ways they are inseparable. They are becoming more and more playful as they feel at home. They only play in short bursts, but they do love to play! Both of them can have short episodes of barking excitedly, however they mostly love to be couch potatoes with you. Pink loves to be close to you or cuddled up with you, and will give you tender kisses every once in awhile. Dolce can be very excited and takes a bit to calm down. She prefers to sleep on our leather couch, probably because it feels cooler. They appear to have never seen a cat before, however they have adjusted very well to our kitty. They get along well with all of the dogs in our house, although Dolce is still learning she does not have to protect anyone from dogs that are moving about. Both of them are trained and faithfully use puppy pads indoors and both of them love to go outside to explore and go potty as well. They can be a bit vocal in the yard with the neighborhood dogs so we do limit their time outside, which is also fine with them. They behave nicely in an Xpen as well, although I am certain they would prefer to sleep in the big human bed. They would do best in a home where they are the only dogs or with dogs that are low energy and their size. They are both very tiny so small children would probably not be the best situation for them, although they are very good with older children. 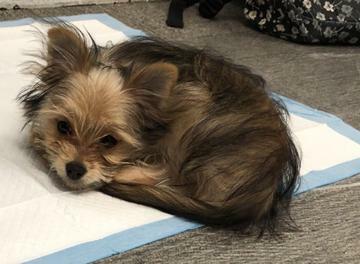 Because they are trained to use the puppy pads, they would be fine loose in a safe environment without being crated as well." Dolce and Pink are both spayed, up to date on vaccines, heartworm negative have had their teeth cleaned and are microchipped! They are fostered in the Orlando area, and their adoption donation is $300 (total). 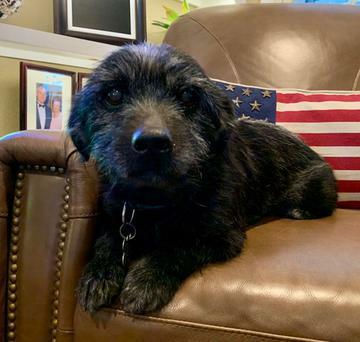 Princeton is a 9 year old male Schnoodle and he weighs about 27 pounds. He arrived in foster care after arriving at animal control after he didn't appreciate being pulled or thrown out of a truck. His foster mom says, "Princeton arrived in foster care confused and stressed. He was very clingy, followed me everywhere, and jumped on me when I arrived home. Surprisingly he did not try to get on the bed with me but waited until he was invited up. Once reassured that I was close by, he slept on the floor next to the bed. He has since gained confidence and feels more secure; however, he still needs to be as close as possible. He doesn’t do well with small dogs (under 10 lbs or so), as he tries too hard to play with them and herd them around the yard. The little pups don’t care for his annoying behavior, although it is never harmful. Initially he was a little too curious about the cats, but they have recently reached an understanding. He seems to be housetrained on a schedule. Because I have a fenced yard, I don't use a leash with him. However, when I open the door to leave the house, he gets very excited and tries to bolt to follow me out. I think he has been leash walked and a refresher course with a harness will strengthen those skills. Princeton will need a patient family to help him overcome his fear of abandonment. I believe he would do well with older dog savvy kiddos, as he can be a little mouthy when playing or seeking a rub. Give Princeton love, security, and guidance, and he will be a wonderful addition to your family!" Princeton is neutered, up to date on vaccines, heartworm negative, microchipped and has had his teeth cleaned! 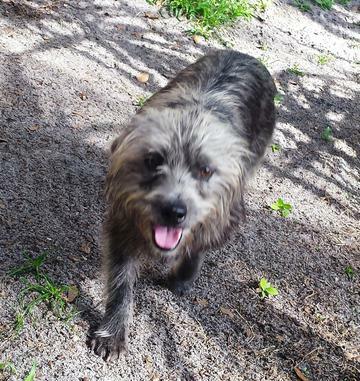 He is fostered in the Flagler Beach area, and his adoption donation is $250. Please note, we are not a shelter. We do not have a kennel or facility that you can visit and see all the dogs. Each dog is fostered in an individual home. We do rescue out of our private homes and in our spare time. So, you cannot come visit our dogs until you have gone through the application and interview process and we have contacted you about scheduling a visit. We do not have set "hours" and we answer all calls and emails as quickly as we can! 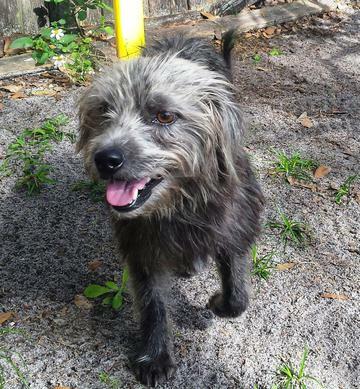 Copyright © 2009-2018 Florida Little Dog Rescue Group. All Rights Reserved.